Amici Voices’ exploration of Bach’s sacred repertory in their one-voice-per-part formation continues with a concert of Lenten Cantatas. 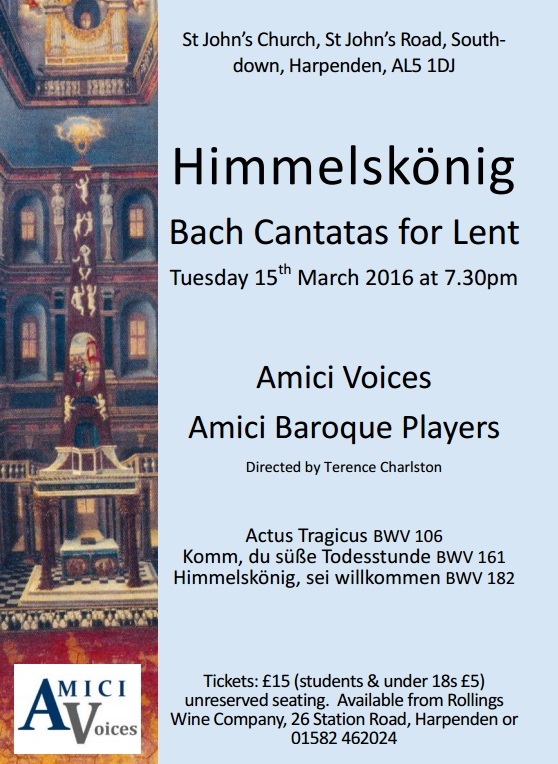 On Tuesday March 15th 2016, they will perform three cantatas: BWV 106, 161 and 182, which are amongst only a handful of surviving Bach vocal works written or suitable for Lent. Once again, Amici Voices will be joined by Amici Baroque Players, who include some of the finest players in their field. The relatively small number of performers (with one player and singer per part) enables the wonderful detail of the music, especially the counterpoint, and the unusual instrumentation, to be better heard and appreciated. The three cantatas occupy a similar emotional and expressive terrain to the Passion settings, exploring the human response to Christ’s suffering, forgiveness and love. If you would like to reserve a ticket for our concert Himmelskönig on March 15th 2016, please fill in the form below. Tickets are £15 (£5 for under 18s and students) – please pay for your reserved ticket when you collect it on the door. Please note that seating is unreserved. We will confirm with you that you have a ticket reserved. If you do not receive confirmation from us within 2 days, do not hesitate to get in touch via the contact page on this website.